Deer Park (Skt. ṛṣipatana) is the place where the Buddha gave his first teaching, the 'First Turning of the Wheel of the Dharma' (see Three Turnings), at Sarnath near Varanasi. 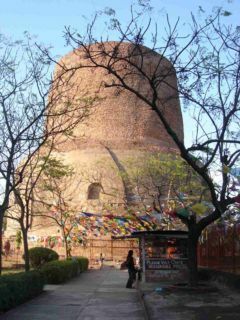 Today pilgrims can visit the place where relics of the Buddha are kept. The Jataka mentions that the Buddha in one of his previous lives was born there as a golden deer who saved the life of a pregnant deer and the name 'Deer Park' derives from this occasion when Shakyamuni was a bodhisattva leading a herd of deer. This page was last edited on 21 August 2017, at 07:53.